TeamRock+ membership is now cheaper than ever. 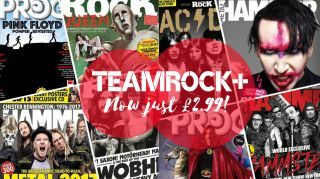 The home of Classic Rock, Metal Hammer and Prog magazines online, TeamRock+ now offers a digital magazine subscription – plus a ton of added benefits (see below) – for less than the cost of a regular digital magazine: just £2.99/$3.99. You’ll get a monthly subscription to one of our three great rock magazines. Choose from Classic Rock, Metal Hammer or Prog and download it straight to your Phone or Tablet. You’ll Instantly receive a free copy of 3 of our best selling digital books giving you the in-depth backstory of Motorhead, Guns and Roses and Pink Floyd. We’ll also send ALL of our new digital books as an when they are published direct to your inbox. Exclusive access to our audio archive – hours of interviews and music. Signing up is easy and quick. Click here to get started.